Oh, how quaint that dotcom management rallying cry sounds today. Back then, it was all about creating internal “company culture.” Now, managers are abuzz about something else: sharing company conversations externally via social media. Today’s winners are the companies who realize the value of sharing (some) internal conversations publicly. In fact, this approach can provide the trust necessary to build a solid sales foundation. A great example is Incept, an Ohio-based contact center to recruit blood donors. Incept uses social media to capture internal conversations and share these with existing and potential clients through social media. The benefits are two-fold: one, these conversations enhance the internal culture, driving employee connections and loyalty. The second benefit is the trust and familiarity these conversations build with people outside the company. Given the adage that “people do business with people they like,” this bolsters sales efforts. Not all of your employees can or should be representing your company in social media channels. Start by selecting a small beta team drawn from those with existing interest or aptitude. Some will be better suited to contributing to a company blog, while others will naturally be more valuable in the “chatter-sphere” of Twitter and Facebook. This selection process should be competitive and treated as a privilege to represent the company brand. Incept employees are referred to internally as iCMEs (internet conversation marketing experts). These iCMEs were divided into teams that write for the Incept blog and those that focused on social media interactions on Twitter and Facebook. The beta team had both existing skill sets. As social media efforts grew, they could train others. On Twitter, employees set up user names such as @Becky_Incept to identify an individual and the company. On Facebook, the beta team used their personal profiles to “like” the Incept Facebook business page. This team helped recruit other employees to participate on the company page by explaining the differences between their personal Facebook profile and the company page. 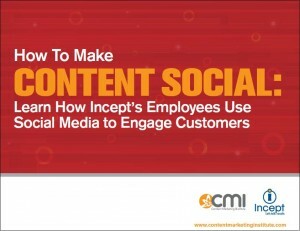 Nate Riggs of Social Business Strategies helped Incept build the social media team. He says that the team intentionally “worked backward.” They chose to allow employees to engage on social media prior to establishing guidelines. Why? It gave the beta team real-world examples of how to handle customer inquiries, questions, compliments and occasionally complaints. The team created boundaries that designated when a request should be answered “further up the chain of command.” For example, employees are asked not to discuss company news until news items are formally “released” to the public. Interestingly, once guidelines were in place, Incept experienced greater participation and engagement online by their employees. This, in turn, drove participation by vendors, customers, prospects and others outside the company. The key is that employees should be given plenty of freedom across all the social media platforms. Whether contributing to the company blog, company Facebook page, company Twitter account or, notably, independently through individual Facebook/Twitter accounts, employees are encouraged to discuss Incept and respond to Incept-related questions. However, by sharing these conversations externally they are also connecting with others around common interests. On branded Twitter accounts for example, such as @Becky_Incept, employees are asked to tweet regularly on the company’s behalf. The remaining time employees, tweet about other topics. Perhaps the biggest transition for companies, including Incept, is the notion that transparency is here to stay. Rather than trying to control employee’s social media interaction with an iron fist (such as banning it from the office computer network), Incept and others lead the way by welcoming transparency and employee representation of their brand online as a new business reality. Read more about Incept’s social media approach in a detailed case study (open access until February 24).